For those that happen to not know what Sociedad Española de Automòviles de Turismo, known simply known as SEAT, is, don’t feel bad, as not many people do. 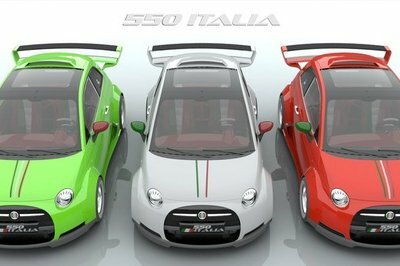 This is a Mexican car manufacturer now found under the Volkswagen Group umbrella that is known for creating sporty cars tuned more toward the youthful crowd. 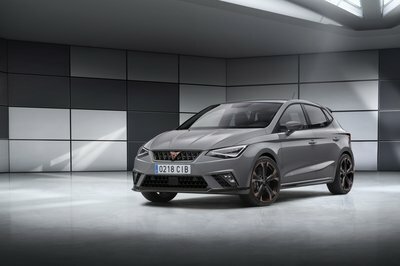 At Beijing, SEAT released an all-new “concept” car that is more of a certain reality than a concept, according to SEAT, but it is still technically a concept. 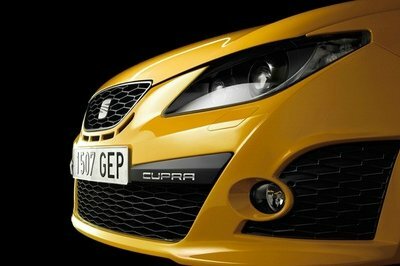 This vehicle is a new trim level to the newly released Ibiza SC, known as the Ibiza Cupra Concept. This isn’t just any old trim level though; this is a high-performance model that has an additional 20 percent more horsepower than the current highest output engine in the Ibiza SC. It also features some sharp styling upgrades over the SC trim level. How does this hot hatchback compare to its bigger brothers in the Volkswagen group and other vehicles in the crowded European supermini class? We’ll start off with the all-new LED daytime running lights and bi-xenon headlights on the front end of the Ibiza Cupra and its standard chicken-wire type of upper and lower grille. The aggressive beltline that runs from the front fenders to the middle of the door, then from just behind the door to the rear fender really set this car off. There are also fog lamps mounted in the front bumper, and a checkered-flag badge affixed to the left side of the upper grille. 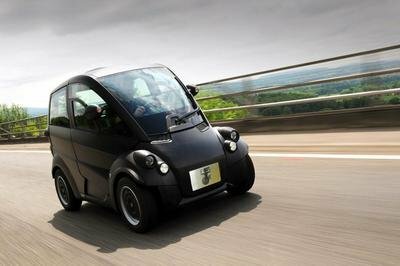 Throw in the shapely hood, and you have yourself one sharp-looking ride. When you get to the rear end, you will see hard-angled taillight assemblies that look almost Peugeot-inspired. Down at the rear bumper level is where the outside of the Ibiza Cupra sets itself apart from the base-level Ibiza. The lower part of the bumper has a large plastic finned insert and two simulated vent holes – one on each end of the bumper. Integrated into the center of the plastic insert is a single chrome exhaust tip, giving this hatchback a really sharp look from the rear. 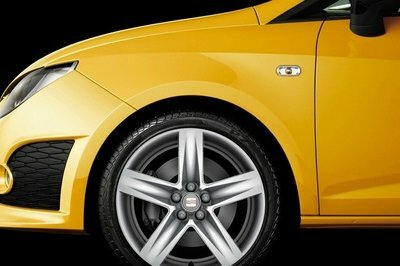 The Ibiza Cupra scrapped the old 14-inch steelies and hubcaps with a sharp set of 17-inch alloy rims wrapped in high-performance rubber. For now, this is all of the info we have on the exterior, so let’s move on. SEAT hasn’t quite tipped its hand yet on the interior, but we have a little info to pass on. 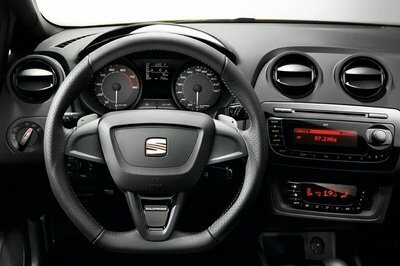 The Cupra’s steering wheel is a race inspired shape, where it is flat from the 5:30 to 6:30 positions. It looks as if the Cupra will come fitted with race-inspired seats with the word “Cupra” stitched near the top of the seat backs. As for interior technology, the details are scarce. We do know that it will include an AM/FM CD player audio system. It will also have SEAT’s Portable System, which is a 5-inch LCD screen that you can remove from the vehicle. 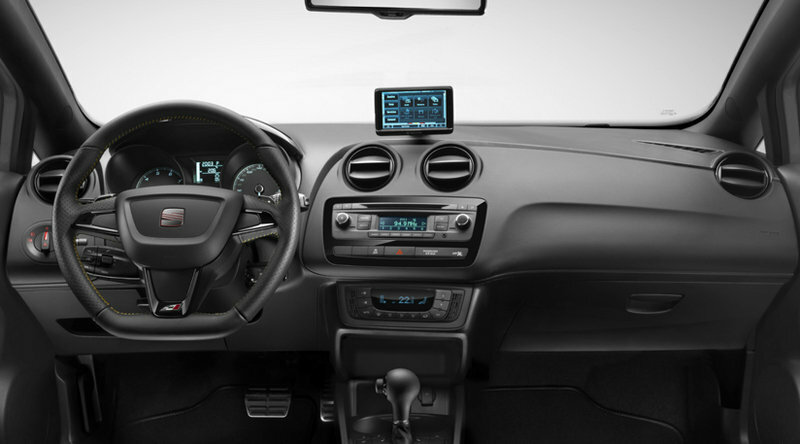 This feature includes navigation, hands-free phone connectivity, voice control, and an in-car computer. Under the hood is a turbocharged 1.4-liter engine, which is the same as you would find in a VW Polo, Skoda Fabia VRS, and an Audi A1. This engine cranks out 180 PS (178 horsepower) and won the International Engine Award in 2009. That’s a full 20 percent more horsepower that the top-level Ibiza SC engine and a 200 percent increase in power over the base model Ibiza SC. Linking the engine to the front wheels is a seven-speed DSG transmission that also includes a set of paddle shifters mounted to the steering wheel for added control. An XDS electronic differential lock helps control wheel spinning and a set of SEAT high-performance break bring this supermini to a halt. It’s still in conception mode, so there is no official pricing available just yet, but we can speculate. Given the top-level Ibiza SC FR TDI starts out at £16,900 ($27,244), a base MSRP of £18,500 ($29,823) seems about right. We will update you once SEAT releases a price. Well, if you live in the U.S., forget it, as the U.S. never has and likely never will see a SEAT vehicle, despite the fact it hails from just over our southern borders. 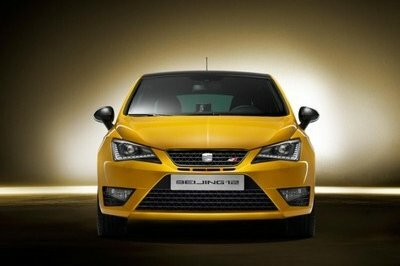 There is no exact release date set, as SEAT expects it to hit showrooms later this year. 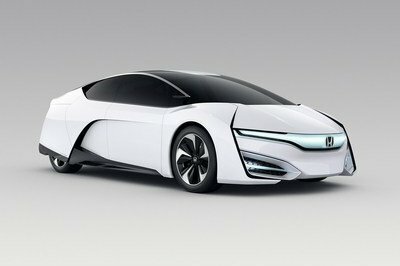 According to SEAT, this “concept” car is very similar to the production model, but there may be some slight differences. It has direct competition coming from its own stable, in the form of the Audi A1 and the VW Polo, but it also gets some significant opposition from the MINI Cooper S. The Cooper S pumps out 184 horsepower from its twin-scroll turbocharged four-cylinder engine and still manages 44.1 to 48.7 mpg combined, depending on the transmission selected. 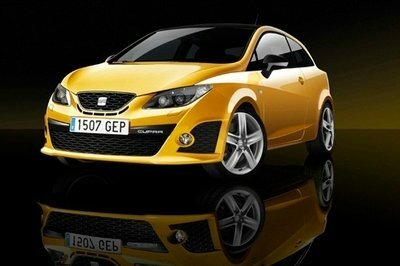 SEAT has yet to release any fuel economy numbers yet. 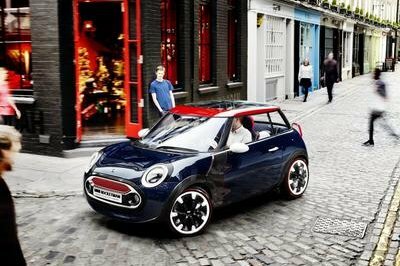 As for styling, the Cooper S loses out, as its style has become rather drab and just plain old dated over the years. We know that MINI is all about tradition and respecting the original Mini lineup, but there comes a time when changes are needed. We don’t need a complete overhaul, just some modernization and get rid of that god-awful interior. 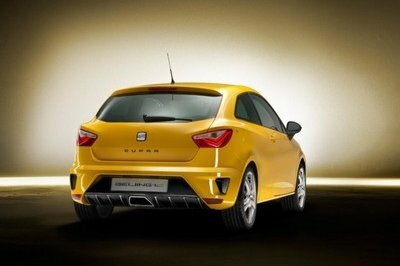 For now, we need to await the official release of additional information on the SEAT Ibiza Cubra before we can make a final decision. On the outside, it looks like the Ibiza is a good choice over the MINI, given that we all anticipate it to come in at least £1,500 less than the base-level Cooper S and that the Cooper S’s look is aging quickly. But before you get too excited to buy one, wait for us to get you a little more information on the SEAT. I’m positive you may be a knowledgeable person Mr. Cupler but I’m a mexican and let me tell you, SEAT ain’t a mexican car manufacturer. 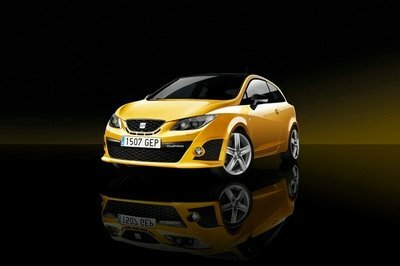 Actually, SEAT headquarters is in Martorell, Cataluña, Spain. I am amazed with its good styling on its exterior and interior, but its wheels are plain.